Happy Friday to everyone! When the calendar hits Friday, that means we are sharing our readers favorite Royal Caribbean cruise photos! Each week we invite our readers to send us their favorite Royal Caribbean photos and we showcase them all right here! Let's begin with a photo by Matthew Hull of Anthem of the Seas "looking" in on St. Kitts. Kinny Lee shared a photo of the entrance to the Boardwalk. Linda shared this photo from a stop in Labadee. Speaking of Labadee, here is a photo by Dalaina Sandland from the top of the Dragon's Breath zip line with Harmony of the Seas in the distance. Our unintentional salute to Labadee continues with this photo by Ken from Labadee with Oasis of the Seas in the background. Michel Dumais takes us to Santorini, where we get this lovely shot of Jewel of the Seas just off the coast. Our final photo this week is by Fred Swanevelt, and it is of Empress of the Seas docked in Havana. 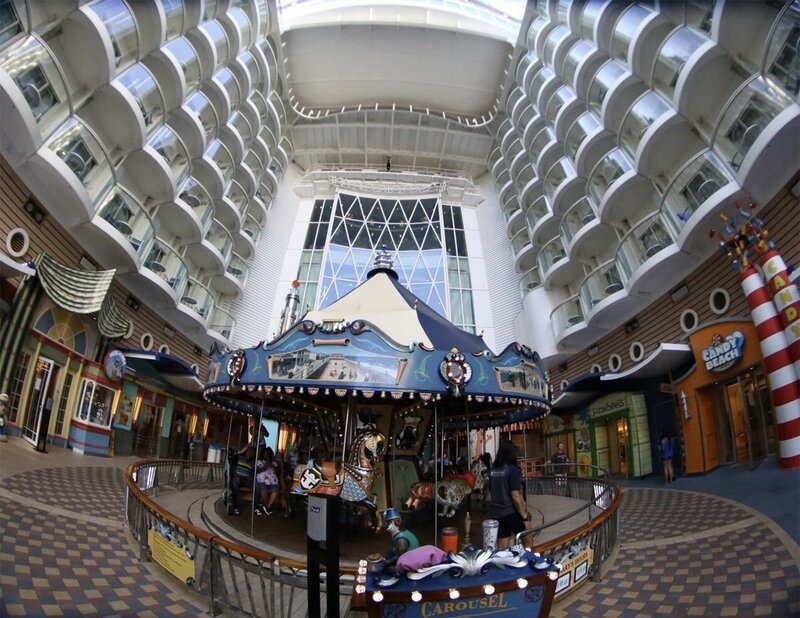 We want to share your Royal Caribbean photos too! Send us your favorite, best, most awesome Royal Caribbean cruise photos by using this form and we will feature them in an upcoming Friday Photos blog post! 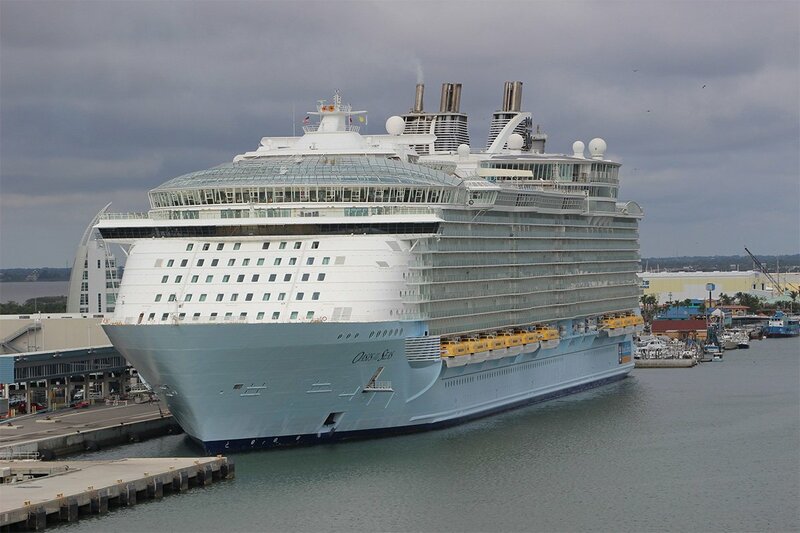 Let us begin with this photo of Allure of the Seas off the port side of Harmony of the Seas. Photo taken by Kinny Lee. Next is a photo of the H2O Zone, taken by Andy Hernandez on Independence of the Seas. Traveler sent in this photo of the Peekaboo Bridge view on Voyager of the Seas. Phyllis Adelsberg shared this photo of Hubbard Glacier, as seen on Radiance of the Seas. Anthem of the Seas was spotted from the top of the Portland Observatory by Travis N. in this photo. Phillip and Mary (Mimi) Webster took this photo in the Old Town of Quebec City. Our final photo this week is by Justin Amrhein of Oasis of the Seas in Port Canaveral, as seen from Grandeur of the Seas. Are you ready to start your weekend? We are sharing some fabulous Royal Caribbean cruise photos that our readers have sent in because we think the best weekends start with a quick Royal Caribbean "fix"! We begin this week with a shot of Anthem of the Seas just offshore from CocoCay, taken by Michael Kho. Khadijah Ahmad sent in this photo from having dinner at Coastal Kitchen on Anthem of the Seas. Stuart Etheridge took this beautiful photo from his first Oasis class cruise. Blake Baldwin caught this sunrise photo on Radiance of the Seas as the ship pulled into Vancouver. Our next photo is by Traveler of deck 12 on Voyager of the Seas in the South China Sea. Kinny Lee shared with us this photo of Central Park at night on Allure of the Seas. We will wrap up this week's photos with a shot of Oasis of the Seas and Liberty of the Seas docked together in Cozumel. Phot by Ken. Thank you to everyone for the great photos this week! If you would like to share your best Royal Caribbean photos, be sure to use this form to send them in! Have a great weekend! Can you believe the weekend is here? When the calendar reaches "Friyay", we are sharing great Royal Caribbean cruise photos that have been sent in by our readers! Our first photo this week is by Ken, and it is of Oasis docked in Labadee. Brent sent in this photo of Anthem of the Seas, as seen from a quiet beach in Bermuda. Here is a look at the lighthouse in Havana harbor, taken by Corey Seeman while onboard Empress of the Seas. Kinny Lee shared this photo of the Boardwalk in the early morning, taken onboard Allure of the Seas. Jenn Ullram took this photo while passing under the Verrazano Bridge while on Anthem of the Seas. 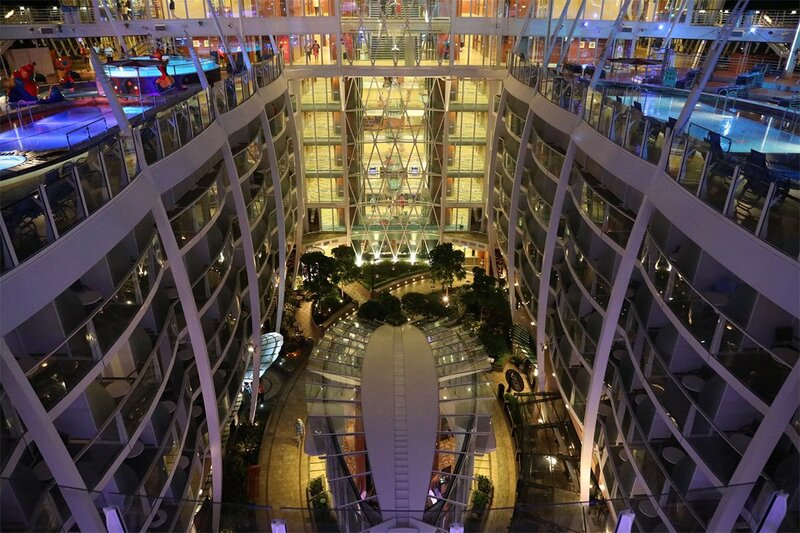 Check out this beautiful shot of Harmony of the Seas, taken by Twangster. Our last photo this week is by Anoop, and it is of Anthem of the Seas docked in Labadee. Thank you to everyone for sharing their photos this week. If you would like to share your best Royal Caribbean cruise photos, use this form and them on in! Have a great weekend! 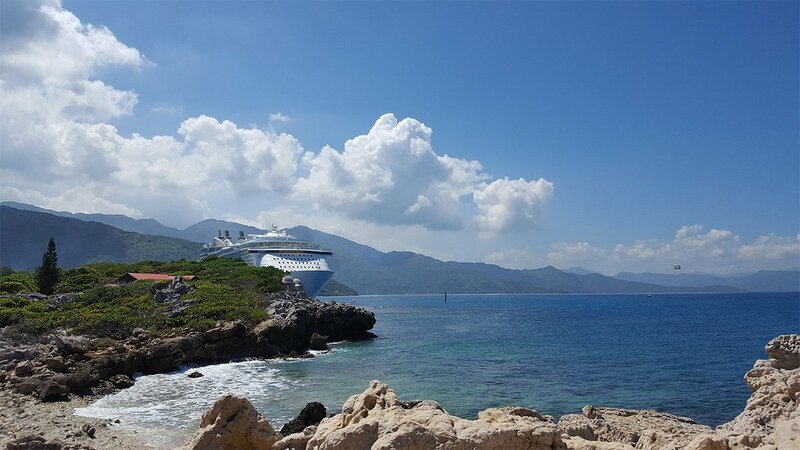 We begin with this photo of Oasis of the Seas behind rocks in Labadee, taken by Ken. Check out the water color in this photo that Ross and Pam took at the Isle of Pines, with Explorer of the Seas in the background! Tony Oleszczuk sent in this photo of Vision of the Seas docked at Akureyri, Iceland. It looks like it was a beautiful day in Central Park on Allure of the Seas when Kinny Lee took this photo. Traveler shared this photo of Voyager of the Seas docked in Vietnam. Twangster shared this photo of Allure of the Seas in Port Everglades, taken while flying home after his cruise. Our final photo this week is by Salvatore Ruggiero, and it is of Oasis of Dreams being performed in the AquaTheater on Oasis of the Seas. Kinny Lee took this long exposure photo of the Carousel at night on Allure of the Seas. Tony Oleszczuk took this photo from his aft cabin on Vision of the Seas, as the ship passed the entrance into St. John's Newfoundland harbor. Here is a carved up watermelon on Freedom of the Seas, taken by Bill Barber. Here is a shot of Anthem of the Seas docked off the coast of CocoCay, taken by Anoop while onboard the tender. This photo taken of Anthem of the Seas from the top of Cadiallac mountain in Bar Harbor, Maine by Jill Snyder. 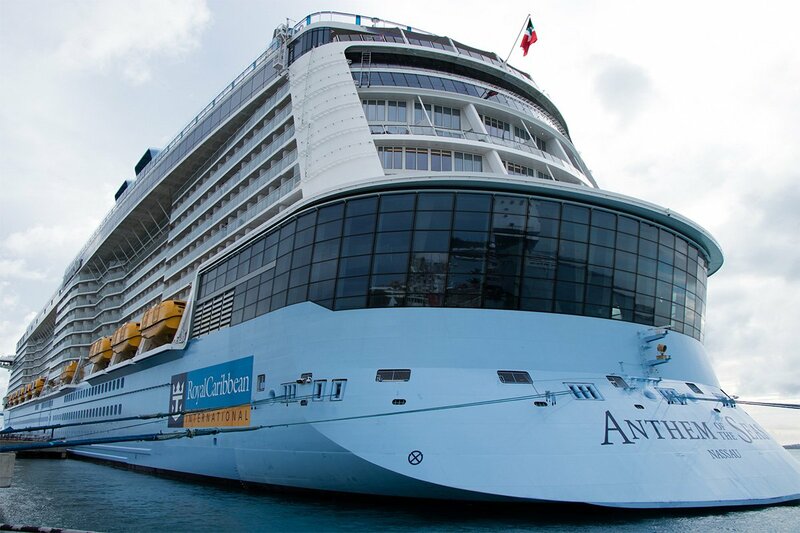 Jesse Mickelson shared with us this photo of Anthem of the Seas in Barbados. We wrap up this week's photos with a look at Anthem of the Seas, as seen from North Star. Photo taken by Matthew Hull. 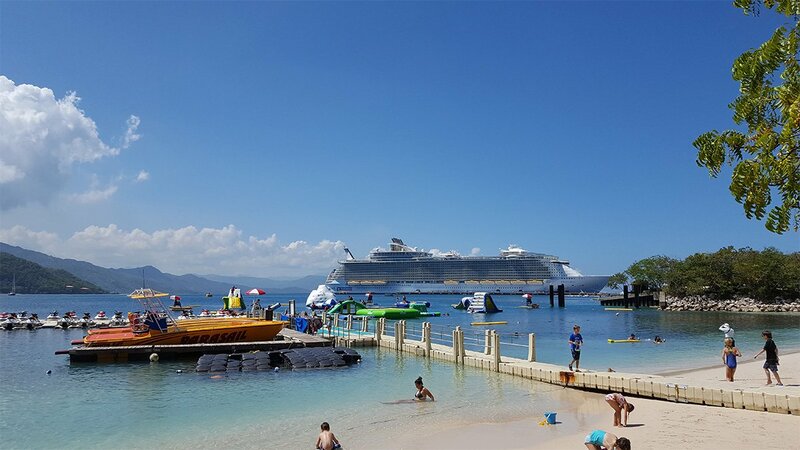 Let's get started with this photo of Allure of the Seas in Labadee, as taken by Kinny Lee while parasailing. Jonny Smith sent in this photo of Navigator of the Seas in Labadee, as seen from the top of the zip line. Henry Greenfield took this photo from his Panoramic View stateroom. Check out this Anthem of the Seas shaped cake that Michael Kho found. Yum! Here is a view of the new Royal Caribbean Crown of Miami cruise terminal under construction as seen during sail away from PortMiami last weekend. Photo by David Berenbaum. John Bamber took this photo of Anthem of the Seas docked in the Royal Naval Dockyard in Kings Wharf, Bermuda. We wrap up Friday Photos with this sunset photo of Voyager of the Seas in the South China sea, taken by Traveler. Happy Friday! This may be a holiday weekend for many of our readers, so grab your matzah or chocolate bunny and let's enjoy some great Royal Caribbean photos that our readers have shared! Kinny Lee found this photo while on a scavenger hut on Allure of the Seas. This looks like one of the Small Wonders hidden on Allure. Twangster shared this photo from Harmony of the Seas of the Ultimate Abyss entrance. Kathy Harris took this photo during her Mediterranean cruise. Arnt Jakobsen took this photo from Labadee, while visiting on Labadee. Don and Meg shared this photo from their Oasis of the Seas excursion at Almaplena Eco resort in Costa Maya, Mexico. Here's another photo by Don and Meg of Freedom and Oasis of the Seas while in Cozumel. Allen Shaffer took this photo during a beautiful day in Skagway, Alaska. Thank you to everyone for sharing these great photos. If you want to share your own photos for a future blog post, use this form to send them in to us! We begin with a look at some of the food from Samba Grill on Allure of the Seas, as seen by Kinny Lee. This would be perfect in our Royal Caribbean Dining Facebook group. Steve Buch sent in this photo, taken from North Star on Anthem of the Seas while docked in St. Kitts. Michael Kho sent in this "painful" photo from his partially obstructed ocean view balcony. It was painful, because his cruise was over at the time of the photo. 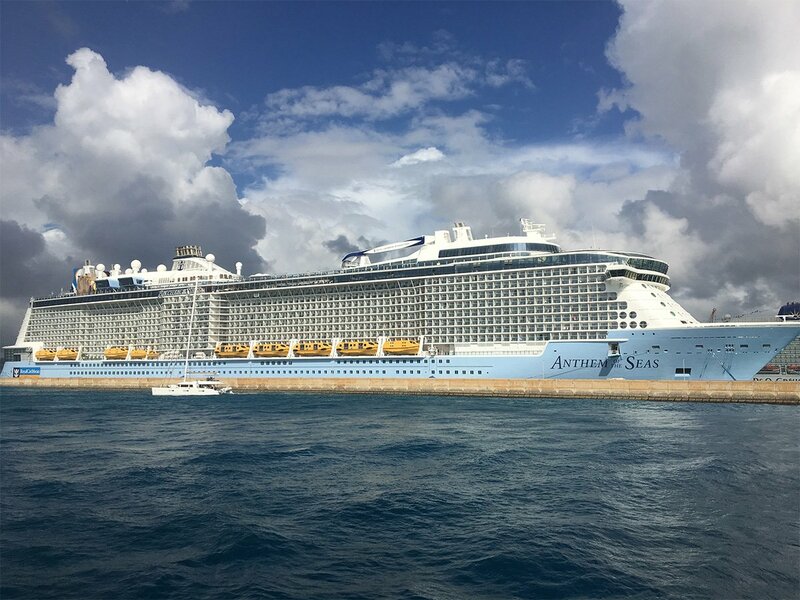 HappyBurger sent in this photo as he/she was arriving to Anthem of the Seas. 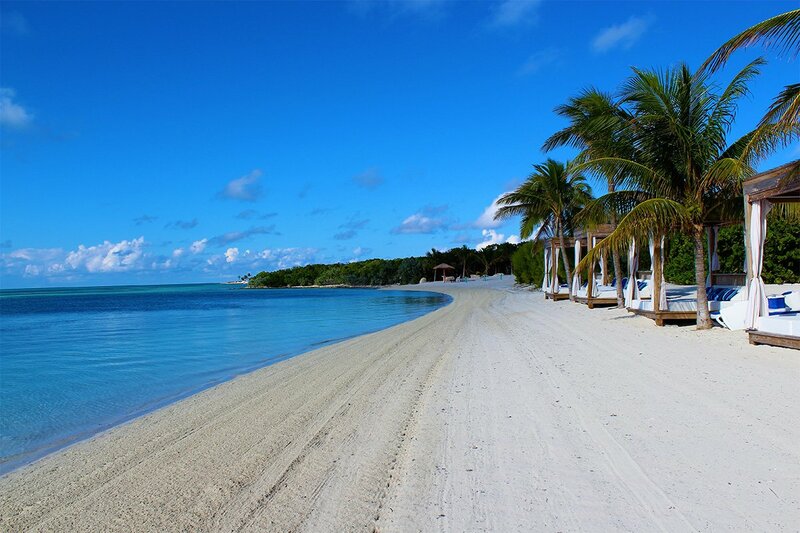 We warm things up with this photo by Doug B. of a beautiful day in CocoCay. 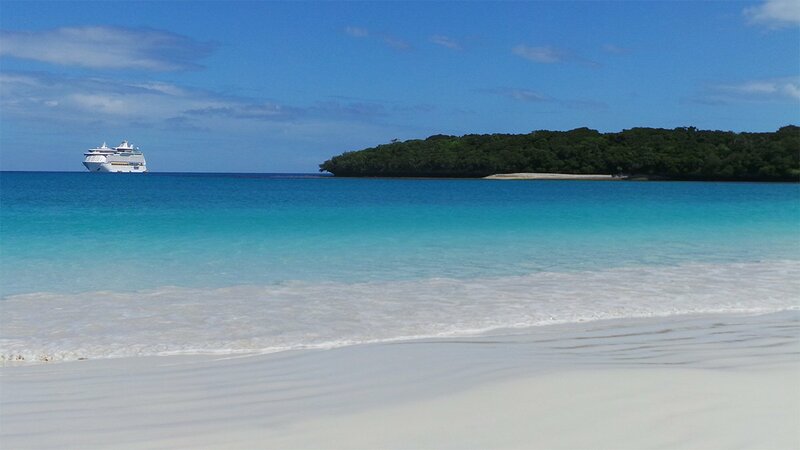 Ross and Pam sent in this beautiful photo of Explorer of the Seas at the Isle of Pines in the South Pacific. Henry Greenfield shared this photo from lunch at Giovannis Table. We begin with a photo by Kinny Lee of the Royal Promenade, as seen from Central Park on Allure of the Seas. John M. Long shared this photo of Vision of the Seas. We move to CocoCay with our next photo, taken by David J. You can see Grandeur of the Seas tendering in the background. Lizz took this beautiful photo of the beach by the beach beds in CocoCay. Lizz's review of the beach beds is stated simply, "On a side note: Beach beds? Totally worth!!!!" Ross and Pam sent in this photo of Explorer of the Seas at the Isle of Pines during a transpacific cruise. Here is a shot from Rhapsody of the Seas by Marnix Van Cauter while in Europe. We wrap things up with this photo of Anthem of the Seas passing under the Verrazano-Narrows Bridge as she departs Port Liberty in Bayonne, New Jersey. Photo by Michael Kho.